WE wonder if we're in some kind of a time-warp. Snuggling up to our wharf in Borneo's jungle township of Sibu is an oddly-shaped little passenger ship with a circular bow and equally circular forward superstructure. She could, we think, be something straight out of a Kipling tale of Borneo's Raj, or Mark Twain's time on the Mississippi. Behind us are chaotic old Chinese-style shop-houses. Rainbow-hued structures housing street-level cafés whose plastic tables and chairs litter the pavement, stores that are out of yester-year with everything from food to hardware and clothing vomiting haphazardly across floors and pavements, a mechanical centre at which a half-dozen oil-stained men tinker with 2-stroke motor-cycle and chainsaw motors that erupt erratically into deafening convulsions of life. And by contrast a snappy Ladies Beauty Salon proudly proclaiming "air-conditioned facilities," and Borneo's biggest produce market. It is July 2009, but it could just as well be any July in the middle of the last century here in south-western Borneo or in old Malacca or Penang or Phuket. So we're not surprised to learn than we're amongst colourful little Sibu's just-2000 overseas visitors annually. We join some fifty other Australian, British and American adventurers and go aboard our quaint-looking craft. But any idea that we are stepping into the hardships of travel of a colonial past are quickly dispelled: this is a brand-new, purpose-built river-boat crafted as meticulously as possible in the style of the ships of the old Irrawaddy Flotilla Company that once chunked the rivers here and "from Rangoon to Mandalay..."
And while the exterior design is yester-year, today's Orient Pandaw – as our ship is named – offers a luxury that Britain's 19th century Raj could only dream of. Our air-conditioned and ensuited stateroom has a picture window, and we've our own little deck space immediately outside our door to further embace kaleidoscopic views and river breezes. And there's a dining room that offers both Asian and Western fare, fusion dishes of the two, fresh local tropical fruits and vegetables, and home-made cakes, cookies and other treats for Orient Pandaw's 56-guests. 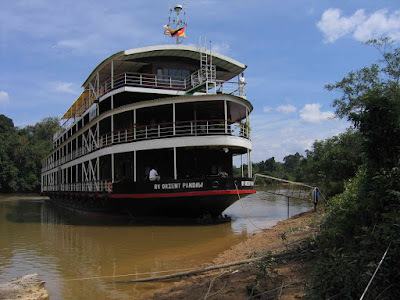 Our ship is the newest in a fleet of a half-dozen such teak and brass river-boats opening-up the rivers of Vietnam, Cambodia, Burmah, India and Borneo to tourists. Scottish entrepreneur and South-east Asian historian, Paul Strachan was fascinated with the story of the original Irrawaddy Flotilla Company that was founded in the 1860s – and which burned all 650 of its ships to the waterline so Japan could not use them to move troops and supplies when it invaded Burma in 1942. He discovered the remains of one, researched original plans and started building look-alike vessels, but with today's mod-cons (although he eschews in-stateroom phones, mini-bars and TVs.) He's now got a half dozen, with Orient Pandaw the latest and plying Borneo's Rajang River that's the longest in Malaysia. Our July cruise is the first such in 67 years, and with her shallow draft, where there are no wharves, Orient Pandaw simply nudges up to riverbanks, beaches or jungle clearings and guests gangplank it ashore. Onboard experts and local guides lead us through villages in which we are as much the centre of interest as these rarely-visited gems are of interest to us. We explore remote "heart of Borneo" forts of the 19th century British Rajahs Brooke, fruit and vegetable farms, sago-making factories, village schools where the kids sing us songs and show us their favourite games, and go on jungle walks. And visit a traditional Iban longhouse in which 700 people live under one roof – each family's "apartment" fronting a communal verandah that appears to stretch into the mountain mist's infinity. And to remind us that this was once headhunter country, the longhouse chief proudly shows us a basket of human skulls, trophies of conquests past. WALK the plank: Orient Pandaw can nudge up to any shore for guests to gangplank it ashore. AN Iban jungle longhouse: 700 people live under one roof and share a communal verandah that "stretches into the mountain mist's infinity." HEAD count. 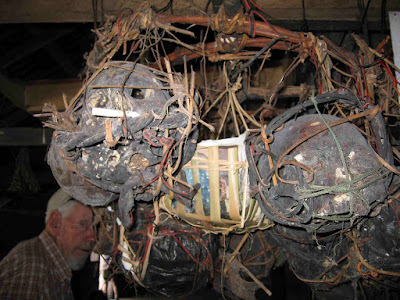 A Pandaw guest checks out the longhouse's collection of skulls from battles past. 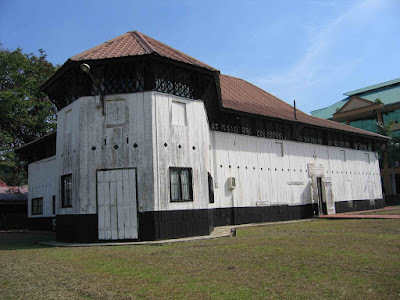 RAJAH Brooke's timber-built Fort Emma is 150 years old.